Jack left my best post out! Did he vote for Obama? 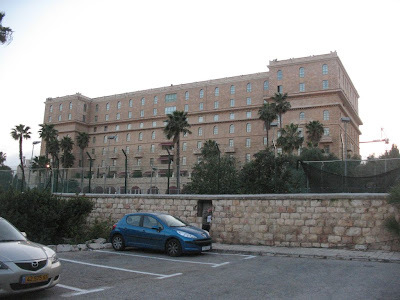 The King David hotel is the hotel that celebrities and high ranking politicians stay at when they visit Jerusalem. I was downtown and took some pics. 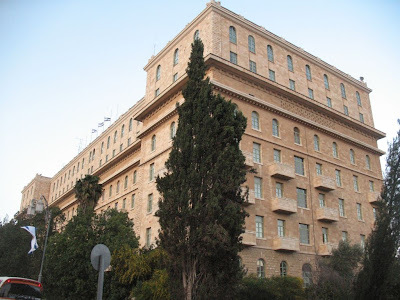 I wonder what King David would say about the hotel that uses his name. The Temple Mount free of foxes and mice. Fine wine, unleavened bread, bitter herbs, and paschal sacrifice. Recieved raging applause from the arrogant low. By the way, "He who says something in the name of the one who said it brings redemption to the world"(Avot 6:6). Therefore, if you recite this at your seder, please say it in the name of "Cosmic X". An “invitation only" joyous ceremony is taking place at this moment in the Old City in Jerusalem, where the centuries-old Hurva synagogue has come back to life after having been destroyed by the Jordanians in the War for Independence in 1948. Muslim and Palestinian Authority leaders claim that Monday’s dedication is a “provocation” and the prelude to a Jewish takeover of the Temple Mount. Security is heavy in the Old City as thousands of Arabs and Bedouin head for the capital"to defend" the Al-Aksa mosque. “Hurva” literally means “ruin” and is located in the heart of the Old City, where a new Torah scroll was ushered into the rebuilt house of worship in Sunday. 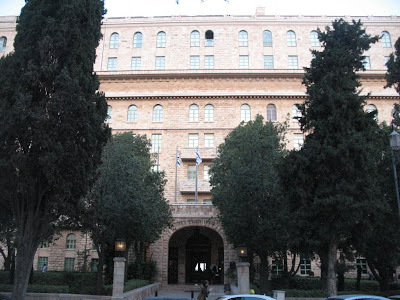 The original building stood as a landmark in the 16th century, and its well known feature in modern times was the 50-foot arch that remained standing after the Jordanian occupation. That arch now is part of the completed synagogue. The destruction in 1948 wasn’t the first time it was demolished. Muslims had lent Jews money in the 1700s to build the house of worship but destroyed it after the Jewish community, living in poverty, was unable to repay the debt. The restored synagogue, a replica of the synagogue as it stood in the 19th century, is the result of four years of work. The truth is even if I had one, I am not sure that I would have attended. Life is pretty hectic now. Peisach is just two weeks away. There is so much to do! Peres emphasized the importance of military service and said that those who serve become better citizens than those who don't, who "lose their way." "If anyone is defending Israel, it's the army," he continued. "The state cannot allow the existence of gaps in recruitment, which endanger the state. Everyone must serve his country. Whoever wants to avoid war must have a strong army. Only a good and powerful army serves as a deterrent." Elder statesman of Israel's parliament, Shimon Peres, 83, falsified the biographical information on his official Knesset Web page to imply military service that he never performed, journalist David Bedein has claimed in the Philadelphia Bulletin. "Military Service Haganah; IDF; Temporary Head of Naval Services, 1950"
But, Bedein claims, citing his biographer and official records, Peres never served in the IDF, the Israel Defense Forces, nor was he the "temporary head of Naval Services" in 1950. In Peres' biography on his official Ministry of Foreign Affairs page, the facts are presented differently: "In Israel's War of Independence (1947-48), Peres was responsible for arms purchases and recruitment, and in 1948 was appointed head of the naval services." Bedein reports that Peres was ridiculed early in his career for not having served in any military capacity in the war of independence for the nascent Jewish state. The official Israel Ministry of Defense Lexicon of Israeli Defense, published in 1976 when Peres was minister of Defense, identifies Peres as only holding a desk job at the new Israel Ministry of Defense, "responsible for naval matters," appointed to that position in 1949. Peres' office, asked for a response on the misrepresentation of Peres on the official site of the Israeli Knesset, declined to comment. His official biographer, Dr. Michael Bar Zohar, however, confirmed that Peres never served in the IDF, Bedein reported. Once I had a conversation with the late Rechavam Ze'evi, may God avenge his blood. He told me that Peres never served in the IDF. I told him that I think that I once saw a picture of him in uniform. Ze'evi replied that the picture must have been taken on Purim! As time passes since the death of arch-terrorist Mahmoud Mabhouh the pronouncements of the Dubai Police get more and more pompous. Dubai's Chief of Police Lt. Gen. Dhahi Khalfan Tamim tells us that he wants to arrest Mossad chief Meir Dagan and Prime Minister Binyamin Netanyahu in connection with the assassination! This guy's chutzpah knows no boundaries. The surveillance camera footage released by the Dubai police incriminate themselves more than anyone else. (The clips can be seen at the bottom of this post.) They unknowingly implicated themselves in a number of offenses, especially the crime of being unbearably haughty. "14:30 A suspect from the surveillance team arrives at another location anticipating the arrival of the victim, as he was known to frequent this hotel." Here Dubai's law enforcement officials inform us that they knew that Mabhouh, a senior member of the Hamas terrorist group, one who is known to have murdered Jews and probably Arabs as well, was "known to frequent" a certain hotel in their jurisdiction. The Dubai police, instead of arresting this murderer, harbored him in their midst. Let's issue a warrant for police chief Tamim's arrest! - Entry by reprogramming the lock on the door to room 230, as the system shows an attempt to do this during this time. - Kevin or Gail could have knocked on the victim's door posing as hotel staff. The Dubai police don't know how Mabhouh's room was entered. The truth is, they don't even really know if the room was entered by anyone other than Mabhouh himself. Mabhouh's room was out of the range of the surveillance cameras, as one can see from the diagram shown in the second clip at 1:35. This gap in knowledge did not prevent the Dubai police as labeling certain people as belonging to "the execution team" (for example in the second clip at 8:41 and 9:02). I wonder if the Dubai police tampered with these tapes. In most of the footage from the various surveillance cameras the date and time are integral part of the frame, appearing on the top or the bottom of the screen. This is not so in the footage from the Al-Bustan hotel. If the time and date were not embedded in the footage, where are the Dubai police getting the times of the events that took place there? If they were part of the original footage, why were they edited out? If you look at the third clip at 9:44, "Gail Foliard" seems enter the frame in a very sudden fashion. It seems to me that the tape was edited here. I would be interested in what experts have to say on the matter. If the tape was indeed edited, then we know why the time was also cut out of the footage. If the footage is authentic, the characters, with their forged passports and wigs are indeed suspicious. The Dubai police mentioned that some of the suspects were in Dubai more than once. It seems to me that if Tamim would have kept his big mouth shut, the police would had a better chance of catching the suspects.